This black Ford GT was among the first to roll off the line, and will be used as a marketing vehicle, Ford said. Jake Lingeman is Road Test Editor at Autoweek, an affiliate of Automotive News, reviewing cars, reporting on car news, car tech and the world at large. The full spec sheet for the Ford GT is out, and the newest American supercar will be the fastest vehicle to wear a Ford badge. Ford said the GT will have a top speed of 347 km/h (216 mph) thanks to a turbocharged V-6 that generates 647 hp at 6,250 rpm and 550 lb-ft of torque at 5,900 rpm. The company also noted the GT laid down a two-minute, 9.8-second time at Calabogie Motorsports Park, about 400 km northeast of Toronto. For comparison, the McLaren 675LT did it in two minutes, 10.8 seconds, and the Ferrari 458 Speciale only managed a time of 2:12.9. The 2005-06 Ford GT previously held the automaker's top speed record at 330 km/h (205 mph), a Ford spokesman confirmed. The Ford GT's dry weight is 1,381 kilograms (3,045 pounds); fluids would add a bit more more, but power-to-weight comes out to 2.14 kilograms (4.72 pounds) per horse. That lands the GT in between what Ford says are its two primary competitors, the 675LT and the Ferrari 488. The GT is priced in the mid-US$400,000s. Ford began GT production Multimatic Inc. in Markham, Ont. in December. Ford is limiting output to 250 a year -- it received more than 6,000 applications for the first 500. It announced earlier this year it will extend production an additional two years, through the 2020 model year. 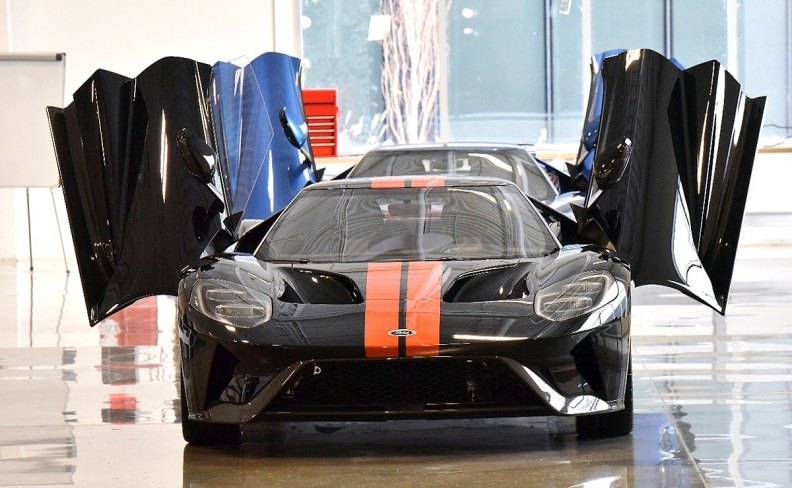 The application process favored current GT owners and Ford loyalists to ensure the new cars will be driven on the road and not stored or flipped for a profit. The third year of production will be set aside for applicants who were placed on the waitlist for the first batch of cars. The application process for fourth-year cars will open in early 2018, Ford said previously.